Barca to sign two new defenders.Barcelona are getting closer to signing themselves a new-look defensive partnership for next season as they hope to complete deals for Jeremy Mathieu and Marquinhos, according to Fichajes.net. 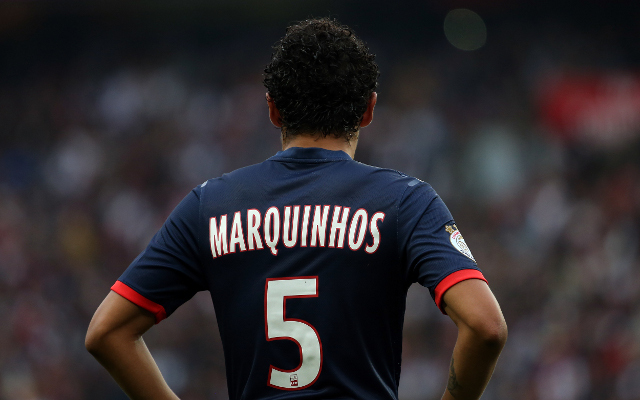 In a deal that could be worth roughly £40m plus the addition of Dani Alves moving to Paris Saint-Germain in place for youngster Marquinhos, Barcelona will land themselves two quality signings in what has been a problem position for the club for some time. With Carles Puyol announcing his retirement and Gerard Pique suffering something of a dip in form in recent times, the £40m pair could instantly become first choice for Luis Enrique’s side next season as they look to re-establish themselves as a force in Spain and Europe after a disappointing trophyless season this term. Valencia centre-back Mathieu, 30, has long been regarded as one of the most solid defensive players in La Liga, and could cost around £16m, while it is thought that around £24m plus Alves would be enough to persuade PSG to part ways with Brazilian starlet Marquinhos just one season after signing him from Roma. Some other big names had been linked as defensive targets for Barcelona, but the likes of Porto youngster Eliaquim Mangala could now be free to join interested Premier League clubs such as Manchester United and Chelsea.